Rome is an open air museum, but once in Rome you can't miss the occasion to visit some of the most beautiful masterpieces ever realized. Between them we found the Vatican Museums, with the Sistine Chapel made by Michelangelo and the marveillous Raphael Stanze, to which we dedicated a special section. But there are many things to see in Rome! Here some suggestion for your trip. You will find also some guided tours that you can book directly with us. The idea of the "Musei Capitolini" was born in 1471 when Pope Sisto IV gave as a gift to Romans a group of bronze statues with great symbolic value. The most of the treasure of this museum had come from the city of Rome. 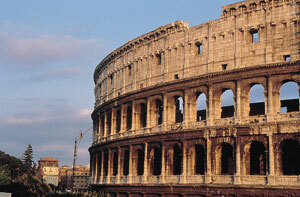 2-Person Rome City Pass: with this special pass you can enjoy Rome's museums and monuments at discounted prices. Other discounts are provided for transportation, bike rental, restaurants, beauty services and much more! The Borghese family collection of classical and sixteenth to nineteenth century sculptures (among which works of Bernini and Canova) and fifteenth to nineteenth century paintings in the building commissioned by Cardinal Scipione Borghese. Explore the art history of Baroque Rome in style on a private walking tour of the Galleria Borghese with an art expert. Accompanied by your own private guide who specializes in art history, you'll enjoy personalized attention on your special private tour of Baroque Rome's Galleria Borghese. If you would prefer to visit the Borghese Gallery and Museum in Rome at your own leisure, without a guide, but would still like to skip the queue with reserved tickets (which regularly sell out a month in advance! ), book your tickets now! Your Borghese Gallery ticket will be pre-booked and pre-paid, for a fast, hassle-free entry. Twelfth to eighteenth century paintings and decorative art collection. Among the paintings, works of Lippi, Raffaello, Caravaggio and Bernini. The museum offers an exhibition of antique sculptures, decorative and architectural terracotta pieces, objects of worship found during the excavations in ancient Ostia. See the extensive excavations of Ancient Ostia, the first Roman colony and former harbor of Rome. With perfectly preserved mosaics and baths, the site rivals Pompeii as a window into life during the Imperial Age. (This tour is seasonal and operates from March to October only). The extraordinary archaeological collection of Foro Romano found buried under the area of Palatino and Campidoglio from ages and ages ago. This museum is composed of two different sections: Egypt and Near East. The collections regarding the Near East are coming from the archaeological researches made by the University La Sapienza and concern southern Phoenicia, Siria and Israel Judea. The museum of Classical Art of the University La Sapienza was founded in 1892 by Emanuel Löwy. The museum hosts a great number of casts of statues from Acropolis of Athens. The museum is mostly composed of reproductions: casts of statues, busts, parts of buildings in natural size. They all represent monuments and architectural complexes of Rome and provinces of the Imperial Rome. The museum is founded in 1950s by Massimo Pallottino. In time museum has increased its exhibitions with a great number of archeological originals, casts, models, and plastics. The museum is situated in the S. Sebastian gate of the Aurelian wall and offers to its visitors a didactic itinerary which was made in 1990. The museum was founded upon the archaeological materials donated by Prof. Rellini from the University of Rome. Visitors can see the archaeological material, explanations of the ways of producing of stuff of flint and their evolution from Paleolithic to Neolithic, explanations of the ways of making ceramics. The museum is situated in a stunning XVI century building with a splendid garden. It was built by Vignola and Ammannati for Giulio III. It contains archaeological departments of southern Etruria and of non Etrurian areas of Lazio and Umbria. The museum offers to its visitors a tour back in the Paleontological Era. There are hundreds of thousands of different objects connected with the most ancient human history. This is a set of museums in rome, split between various branches across the city. It was founded in 1889 and inaugurated in 1890, during the Risorgimento. It offers collections with antiquities from between the 5th century BC to the 3rd century AD. Collections of ancient sculptures, Egyptian, Assyrian, Cypriot, Etruscan, Greek, Roman and medieval. The monumental altar inaugurated on 30 January 9 a.C. to celebrate the military successes in Gaul and Spain and consecrate peace in the empire. The dynastic tomb of the emperor and his family built by Augustus in 29 b.C. One of the largest collection of paintings, sculptures, and graphic art by artists, mostly Italian, from the last century to the present day. The gallery also has very vast library and specialised archives. Trajan's Market is a large complex of ruins in Rome situated on the Via dei Fori Imperiali. From the 2007 it hosts the museum of Imperial Forums. A representative panorama of Italian art from the end of the last century and contemporary art to 1945. Fourteenth to eighteenth century paintings. Among the most important artists represented: Beato Angelico, Rubens, Poussin. Important collections of sculpture , as well as collections of porcelain and ceramics, enamel paintings and silverware. Situated inside Palazzo Brancaccio, the museum represents the most important Italian collection of oriental art. Plaster cast of statues, reliefs and inscriptions; models reconstructing buildings in Rome and the province of the empire and reproductions of everyday objects. Important models of Imperial Rome and archaic Rome and plaster casts of the Trajan Column.